Well summer is officially over. I have to say that I've had some great grub throwing some BBQs over the last few months. Due to the scorching heat, I usually like grilling fast and what better than carne asada. 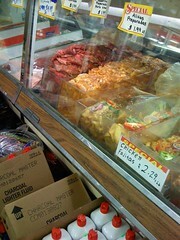 And being the lazy efficient person that I am, I checked out a few carnecerias for pre-seasoned meats. My go-to place is called Linda Rosa Meat Market in Pasadena - a hole-in-the-wall small grocery in the back of a sad looking parking lot. They have a meat section in the far corner of the store and this is the best carne preparadas and pollo preparadas that I've found in the area. 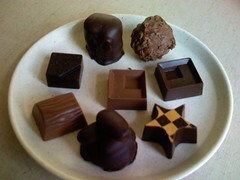 I was on my way to Fish King, driving up Verdugo and I saw a chocolate shop so I stopped out of curiosity. Very cool find. If you're a chocoholic, this is paradise. 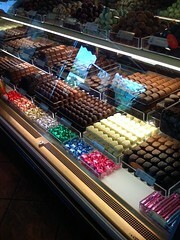 The display case is stacked full of beautiful chocolates of all shapes and flavors. It is almost too much choice! I got a handful of random selections and they were all awesome - but I can't remember what flavors they were. And the prices seemed low to me. They have an attached cafe and some seating so its a great place to stop by for a sweet pick-me-up.